The solar farm is a joint project of the Bega Valley Shire Council and the community organisation, Clean Energy for Eternity. Council’s General Manager, Leanne Barnes, who accepted the award last week, said the Local Government Awards are prestigious and recognise the excellent contributions and outstanding achievements and innovations implemented to advance and improve the Local Government sector in NSW. They are designed to recognise both project-based initiatives and continuous improvement programs undertaken individually or within a team. Ms Barnes said that, as one of Australia's first community solar farms, the project is practical, aesthetic and environmentally responsible by creating a working solar farm and art installation that gets people thinking about sustainable energy use. “The 30 kilowatts ground-mounted solar installation, arranged to form the word 'IMAGINE' can be clearly seen by passing flights,” she said. “It is a great example of how Local Government can work with its community to tackle key challenges in a positive way. 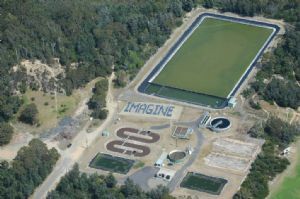 “The energy generated by the solar panels offsets electricity used by the Council-owned Tathra Sewerage Treatment Plant. “Money saved is placed into a fund managed by CEFE for future community projects. The solar farm project also won a 2015 NSW Government's Green Globe Award celebrating excellence, leadership and innovation in sustainability. Photograph: The Tathra Community Solar Farm at the Tathra Sewerage Treatment Plant.